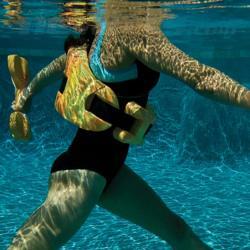 Our Aquatic Fitness program combines the strength-building benefits of Pilates with the cardio of an aerobics class. The movements help to tone muscles, with particular focus on core strength and balance. We use barbells, noodles, and belts suited to your individual needs and fitness goals. We conduct Aquatic Fitness classes Monday, Wednesday, and Friday mornings from 7:00 – 8:00 AM and 8:30 – 9:30 AM. Tuesday and Thursday afternoons from 3:30 – 4:30 PM. We also offer, on Monday, Wednesday, and Friday, a Back Wellness class. This class is a zero impact class, mostly in shallow water. We focus on stretching, range of motion, and the reconditioning of the core muscle groups. The cost for these classes is $84 per month for three classes a week, $56 per month for two classes a week, and $10 per class on a drop-in basis. ALWAYS your first class is free so you can see for yourself if water fitness is for you. Just call us and let us know which class you would like to attend. Cindi Albright has been teaching water fitness classes for over ten years. She is currently certified through Water Art. She has an extensive understanding of anatomy and physiology. Cindi teaches our Back Wellness Class and understands the impact that we as instructors can have working with someone who is recovering from an injury or an illness. She also leads a mean early morning, high energy, workout that incorporates shallow water as well as deep. She uses all of our equipment at any given time, her music is great, and everyone has a great time and gets a great work out! Kathy Zuk has been teaching fitness, dryland and water, for 30 years. Her certifications include The Aerobics Academy, Aquatic Exercise Association, and currently Water Art. Kathy’s classes are primarily deep water. Everyone in her class works out at their personal level. Whether you are advanced or a beginner to fitness, Kathy will give you options for every movement and share with you how you can maximize your time in the pool. She also incorporates the use of hand buoys, noodles and great music to make classes fun and effective!